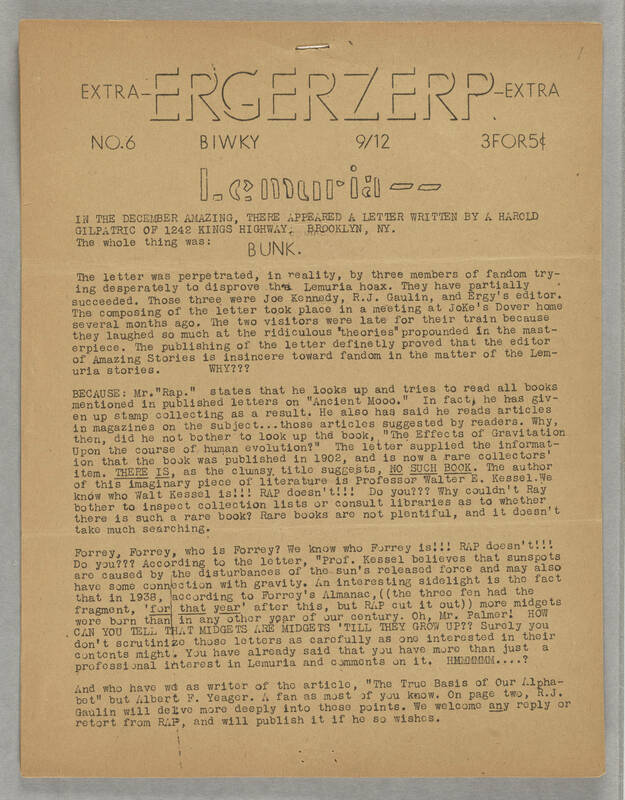 EXTRA ERGERZERP EXTRA NO.6 BIWKY 9/12 3FOR5c Lemuria - - IN THE DECEMBER AMAZING, THERE APPEARED A LETTER WRITTEN BY A HAROLD GILPATRIC OF 1242 KINGS HIGHWAY, BROOKLYN, NY. The whole thing was: BUNK. The letter was perpetrated, in reality, by three members of fandom trying desperately to disprove the Lemuria hoax. They have partially succeeded. Those three were Joe Kennedy, R.J. Gaulin, and Ergy's editor. The composing of the letter took place in a meeting at Joke's Dover home several months ago. The two visitors were late for their train because they laughed so much at the ridiculous "theories" propounded in the masterpiece. The publishing of the letter definetly (sic) proved that the editor of Amazing Stories is insincere toward fandom in the matter of the Lemuria stories. WHY??? BECAUSE" Mr. "Rap." states that he looks and tries to read all books in published letters on "Ancient Mooo". In fact, he had given up stamp collecting as a result. He also had said he reads articles in magazines on the subject...those articles suggested by readers. Why, then, did he not bother to look up the book, "The Effects of Gravitation Upon the course of human evolution?" The letter supplied the information that the that the book was published in 1902, and is now a rare collectors' item. THERE IS, as the clumsy title suggests, NO SUCH BOOK. The author of the imaginary piece of literature is Professor Walter E. Kessel. We know who Walt Kessel is!!! RAP doesn't!!! Do you??? Why couldn't Ray bother to inspect collection lists or consult libraries as to whether there is such a rare book? Rare books are not plentiful, and it doesn't take much searching. Forrey, Forrey, who is Forrey? We know who Forrey is!!! RAP doesn't!!! Do you??? According to the letter, "Prof. Kessel believes that sunspots are caused by the disturbances of the sun's released force and may also have some connection with gravity. An interesting sidelight is the fact that in 1938, according to Forroy's Almanax, ((the three fen had the fragment, "for that year" after this, but RAP cut it out)) more midges were born than in any other year of our century. Oh, Mr Palmer! HOW CAN YOU TELL ME THAR MIDGETS ARE MIDGETS 'TILL THEY GROW UP?? Surely you don' scrutinize those letters as carefully as one interested in their contents might. You have already said that you have more than just a professional interest in Lemuria and comments on it. HMMMMMM....? And who have we as writer of the article, "The True Basis of Our Alphabet" but Albert F. Yeager. A fan as most of you know. On page two, R.J. Gaulin will delve more deeply into these points. We welcome any reply or retort from RAP, and will publish it if he so wishes.